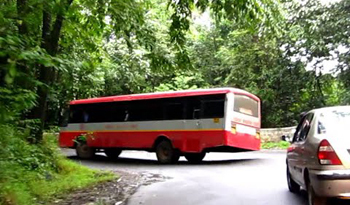 Bantwal, June 16, 2015: As per reliable information, the Charmadi Ghat stretch was blocked for more than 10 hours, when a KSRTC bus tyre got stuck in a drain, late June 14 night. The bus heading towards Bengaluru from Mangaluru remained stuck at the fourth curve of the ghat section from 11 pm till 9 am June 15. The police later facilitated the movement of light vehicles on one side around 6 am. The bus was finally lifted at 9 am. Passengers on the bus from Dharmasthala and Mangaluru spent the night on the road. Travel was a real nightmare especially children were crying for food and water. Though the road was blocked throughout the night, the police were not seen around. This worsened the situation, not aware of the traffic block, many vehicles joined the traffic chaos rapidly. It was only in the morning that the KSRTC stopped all buses towards Mangaluru at Kottigehara. The check post gate was closed to prevent the entry of vehicles into the ghat section. Passengers were of the view that the closure of Shiradi Ghat to facilitate road work, was reason the density of vehicles on Charmadi Ghat increased. The sufferings of the passengers could be understood by only those who got struck in the traffic in the middle of the forest at nighy. The State government should wake up and deploy additional staff and communication points on the ghat section at least.